" Sorry Out of Print! " 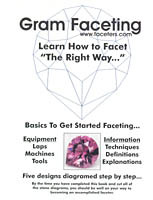 Learn How to Facet the Right Way presents detailed instructions regarding the use of faceting equipment and faceting techniques. The text is lavishly illustrated with photographs and diagrams. Shown is the basic equipment a new faceter will need along with explanations as to why and how it is used. There are pictures of most of the commonly available faceting machines along with descriptions of their controls. Other topics covered and demystified for the beginning faceter include faceting and gemstone nomenclature, stone design basics, scoring and charging laps, dopping and transferring proceedures, use of cheaters, how to read faceting diagrams, setting up and adjusting faceting machines, and more. 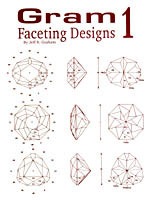 Oriented to learning by doing, this text presents a hands-on approach to faceting five instructive designs with detailed step-by-step diagrams and pictures serving to concisely illustrate the process of faceting each design. Projects start with "Easy 8", a very simple basic octagon design, and progress through "Easy Cushion", "Floater Trillion", "Round Brilliant", and "Brilliant Pear". By the time you have cut each of these introductory designs, the basic principles of faceting will be understood and and have been learned. Highly recommended. Loose leaf with binder and protector sheet for the diagrams, 8.5" x 11" sheets, 58 pages. If you're a faceter looking for new, high performance cuts, you'll definitely appreciate Jeff Graham's highly acclaimed gemstone designs. These gem designs are created and optimized for specific materials such as Beryl, Cubic Zirconia, Garnet, Quartz, Sapphire, Topaz, or Tourmaline. The diagrams are organized by recommended material - no transposing or tangent ratioing required! Each of the 42 designs presented are ray-traced, test cut, and proven. Jeff Graham's design series feature sharp, high quality printing on loose leaf pages. 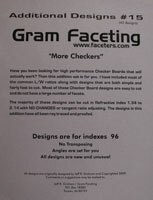 Gram 1 Faceting Designs is the first in a series of design collections featuring Jeff Graham's designs. Loose leaf with binder and protector sheet for the diagrams, 8.5" x 11" sheets, 63 pages. Note: picture is displaying only 1-6, if you order this you will recieve the complete set. 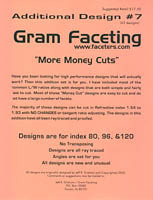 Gram Faceting Designs Additional Design #1 is the second design collection in the series of Jeff Graham's highly acclaimed gemstone designs for faceters. 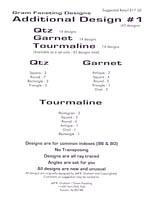 This design packet features 42 additional designs - 14 designs optimized for Quartz, 14 designs optimized for Garnet, and 14 designs optimized for Tourmaline - no transposing or tangent ratioing required! Each of the 42 designs presented are ray-traced, test cut, and proven, and are faceted using 96 and 80 indexes. 8.5" x 11" sheets, 44 pages. 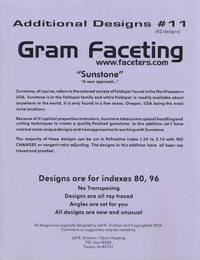 Gram Faceting Designs Additional Design #2 is the third design collection in the series of Jeff Graham's highly acclaimed gemstone designs for faceters. This design packet features 42 additional designs - 6 designs optimized for Quartz, 7 designs optimized for Tourmaline, 5 designs optimized for Topaz, 6 designs optimized for Garnet, 2 designs optimized for Apatite, 1 design optimized for Tanzanite, 1 design optimized for Opal, 3 designs optimized for Peridot, 3 designs optimized for Sapphire, 1 design optimized for Cubic Zirconia, 3 designs optimized for Spinel, 1 design optimized for Beryl, and 3 designs optimized for Zircon - no transposing or tangent ratioing required! Each of the 42 designs presented are ray-traced, test cut, and proven, and are faceted using 96 and 80 indexes. 8.5" x 11" sheets, 43 pages. 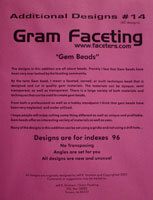 Gram Faceting Designs Additional Design #3 is the forth design collection in the series of Jeff Graham's highly acclaimed gemstone designs for faceters. 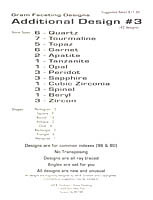 This design packet features 42 additional designs - 6 designs optimized for Quartz, 7 designs optimized for Tourmaline, 5 designs optimized for Topaz, 6 designs optimized for Garnet, 2 designs optimized for Apatite, 1 design optimized for Tanzanite, 1 design optimized for Opal, 3 designs optimized for Peridot, 3 designs optimized for Sapphire, 1 design optimized for Cubic Zirconia, 3 designs optimized for Spinel, 1 design optimized for Beryl, and 3 designs optimized for Zircon - no transposing or tangent ratioing required! Each of the 42 designs presented are ray-traced, test cut, and proven, and are faceted using 96 and 80 indexes. 8.5" x 11" sheets, 43 pages. 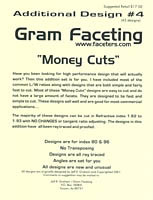 Money Cuts is the fifth design collection in the series of Jeff Graham's highly acclaimed gemstone designs for faceters. 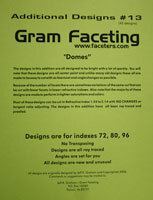 This design packet features 42 additional designs which are easy to facet and do not have a large number of facets. These patterns are designed to be fast and simple to cut and utilize most of the standard length to width ratios. Stones faceted using these designs sell well and are good for most commercial applications as well as suitable for cutting by beginning to intermediate faceters who are ready to expand their faceting horizons. The majority of the designs presented in Money Cuts can be cut in materials with refractive indexes ranging from 1.62 to 1.93 with no transposing or tangent ratioing required! Each of the 42 designs presented are ray-traced, test cut, and proven, and are faceted using 80 and 96 indexes. 8.5" x 11" sheets, 44 pages. 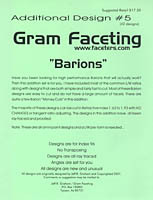 Barions is the sixth design collection in the series of Jeff Graham's highly acclaimed gemstone designs for faceters. This design packet features 42 additional designs utilizing the Barion design concept. Barion designs, originally developed by the diamond trade, have also revolutionized the design of colored stones by providing brightness that is otherwise unachievable in faceted stones with higher length to width ratios and low symmetries. The majority of the designs presented in Barions can be cut in materials with refractive indexes ranging from 1.62 to 1.93 with no transposing or tangent ratioing required! Each of the 42 designs presented are ray-traced, test cut, and proven, and are faceted using a 96 index. 8.5" x 11" sheets, 43 pages. CheckerBoards - Money Cuts is the seventh design collection in the series of Jeff Graham's highly acclaimed gemstone designs for faceters. 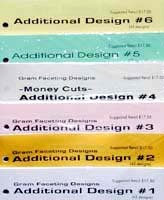 This design packet features 42 additional designs utilizing CheckerBoard crowns and serve to expand the author's popular "Money Cuts" design series. These CheckerBoard patterns are designed to be fairly fast and easy to cut and utilize most of the standard length to width ratios. Stones faceted using these designs sell well and are good for most commercial applications. The majority of the designs presented in CheckerBoards - Money Cuts can be cut in materials with refractive indexes ranging from 1.62 to 1.93 with no transposing or tangent ratioing required! Each of the 42 designs presented are ray-traced, test cut, and proven, and are faceted using 96 and 120 indexes. 8.5" x 11" sheets, 44 pages. More Money Cuts is the eighth design collection in the series of Jeff Graham's highly acclaimed gemstone designs for faceters. This design packet further expands on the author's popular Checker Boards and "Money Cuts" design series and features 42 additional designs which are easy to facet and do not have a large number of facets. These patterns are designed to be fast and simple to cut and utilize most of the standard length to width ratios. Stones faceted using these designs sell well and are good for most commercial applications as well as suitable for cutting by beginning to intermediate faceters who are ready to expand their faceting horizons. The majority of the designs presented in More Money Cuts can be cut in materials with refractive indexes ranging from 1.54 to 1.93 with no transposing or tangent ratioing required! Each of the 42 designs presented are ray-traced, test cut, and proven, and are faceted using 80, 96 and 120 indexes. 8.5" x 11" sheets, 44 pages. Diamond Checker Boards - Money Cuts is the ninth design collection in the series of Jeff Graham's highly acclaimed gemstone designs for faceters. 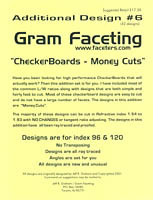 This design packet further expands on the author's popular Checker Boards and "Money Cuts" design series and features 42 additional designs which are easy to facet and do not have a large number of facets. These patterns are designed to be fast and simple to cut and utilize most of the standard length to width ratios. Stones faceted using these designs sell well and are good for most commercial applications as well as suitable for cutting by beginning to intermediate faceters who are ready to expand their faceting horizons. 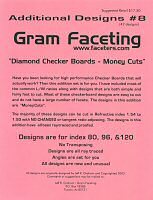 The majority of the designs presented in Diamond Checker Boards - Money Cuts can be cut in materials with refractive indexes ranging from 1.54 to 1.93 with no transposing or tangent ratioing required! Each of the 42 designs presented are ray-traced, test cut, and proven, and are faceted using 80, 96 and 120 indexes. 8.5" x 11" sheets, 44 pages. 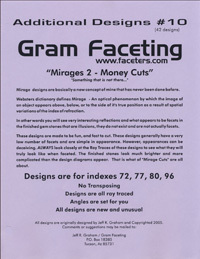 Mirages - Money Cuts is the ninth design collection in the series of Jeff Graham's highly acclaimed gemstone designs for faceters. This design packet further expands on the author's popular Checker Boards and "Money Cuts" design series and features 42 additional designs which are easy to facet and do not have a large number of facets. These patterns are designed to be fast and simple to cut and utilize most of the standard length to width ratios. Stones faceted using these designs sell well and are good for most commercial applications as well as suitable for cutting by beginning to intermediate faceters who are ready to expand their faceting horizons. The majority of the designs presented in Mirages - Money Cuts can be cut in materials with refractive indexes ranging from 1.54 to 1.93 with no transposing or tangent ratioing required! Each of the 42 designs presented are ray-traced, test cut, and proven, and are faceted using 72, 77, 80 and 96 indexes. 8.5" x 11" sheets, 44 pages. Mirages 2 - Money Cuts is the ninth design collection in the series of Jeff Graham's highly acclaimed gemstone designs for faceters. This design packet further expands on the author's popular Checker Boards and "Money Cuts" design series and features 42 additional designs which are easy to facet and do not have a large number of facets. These patterns are designed to be fast and simple to cut and utilize most of the standard length to width ratios. Stones faceted using these designs sell well and are good for most commercial applications as well as suitable for cutting by beginning to intermediate faceters who are ready to expand their faceting horizons. The majority of the designs presented in Mirages 2 - Money Cuts can be cut in materials with refractive indexes ranging from 1.54 to 1.93 with no transposing or tangent ratioing required! Each of the 42 designs presented are ray-traced, test cut, and proven, and are faceted using 72, 77, 80 and 96 indexes. 8.5" x 11" sheets, 44 pages. Sunstone - A new approach... is the ninth design collection in the series of Jeff Graham's highly acclaimed gemstone designs for faceters. This design packet further expands on the author's popular Checker Boards and "Money Cuts" design series and features 42 additional designs which are easy to facet and do not have a large number of facets. These patterns are designed to be fast and simple to cut and utilize most of the standard length to width ratios. Stones faceted using these designs sell well and are good for most commercial applications as well as suitable for cutting by beginning to intermediate faceters who are ready to expand their faceting horizons. The majority of the designs presented in Sunstone - A new approach...can be cut in materials with refractive indexes ranging from 1.54 to 1.93 with no transposing or tangent ratioing required! Each of the 42 designs presented are ray-traced, test cut, and proven, and are faceted using 80 and 96 and indexes. 8.5" x 11" sheets, 44 pages. Glitter - Money Cuts is the ninth design collection in the series of Jeff Graham's highly acclaimed gemstone designs for faceters. This design packet further expands on the author's popular Checker Boards and "Money Cuts" design series and features 42 additional designs which are easy to facet and do not have a large number of facets. These patterns are designed to be fast and simple to cut and utilize most of the standard length to width ratios. Stones faceted using these designs sell well and are good for most commercial applications as well as suitable for cutting by beginning to intermediate faceters who are ready to expand their faceting horizons. 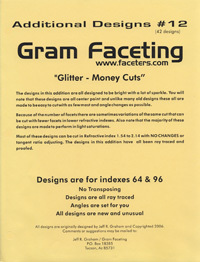 The majority of the designs presented in Glitter - Money Cuts can be cut in materials with refractive indexes ranging from 1.54 to 1.93 with no transposing or tangent ratioing required! Each of the 42 designs presented are ray-traced, test cut, and proven, and are faceted using 64 and 96 and indexes. 8.5" x 11" sheets, 44 pages. Facet Cutters Handbook is a classic faceting primer written for the primary purpose of helping the beginning faceter and those who still consider themselves in this class. Separate sections are devoted to faceting nomenclature, dopping, polishing, faceting angles and hints, and index conversion. Presented are diagrams and instructions for cutting the Standard Brilliant, Calibre, Triangle Step, Cardinal, Emerald, Six-Rayed Star, Pentagon, Cut-Corner Triangle, Cardinal Kite, Cut-Corner Kite, Keystone Step, Keystone Cardinal, Cut-Corner Keystone, Oblong Hexagon, Modified Square Brilliant, Don Diego, Step Cut round, Double Bar, Bar Cut Pendeloque, Hexagonal Brilliant, Opposed Bar, and Scintillator Brilliant. Soft cover, 5.5" x 8.5", 64 pages. 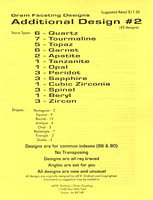 Diagrams for Faceting Volume II follows the authors' first collection of gemstone designs, originally published in 1975. This book is divided into twelve sections, each section serving to group designs which are closely related: the Round Brilliants, Ovals and their relatives, Diamond shapes, the Split Facet Technique, Pendeloques, Hearts, Triangles, Squares and Rectangles, Pentagons and Stars, Hexagons, Octagons, and Barions and Pseudobarions. Included are diagrams to cut 132 different gems, plus drawings from Ernst Wollert that will produce another 20 gems. Most of the complex diagrams will produce fine gems. Some do not cut into what would normally be called excellent gems, but instead gemstones that are unusual. As a whole, the more complex diagrams are challenges to suit the advanced faceter. Nearly all the diagrams are accompanied by some text giving some interesting aspects of the cut, cutting tips and hints, and some information of what type of faceting material is best for the cut. Hard cover, 7" x 11", 151 pages.